To subscribe for email updates, use the form in the sidebar. 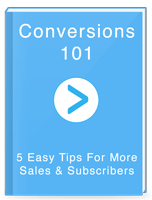 I’ll send you the free e-book, Conversions 101, which has 5 easy tips you can use to improve your website today. I’ll also email you when new posts go live here on the blog. I plan to publish something every few weeks, so you don’t have to worry about getting a bunch of extra emails. Every post will have actionable advice you can use to build a better business.